Okay folks. We have reminded you over and over and over again not to use the same password for all the sites that require you to login. We’ve urged you to get a good password manager like LastPass (free) or Roboform. However, when we help people with their computers, we find that many of them do not have a password manager, and if we need to have them login to a site for us to see what the problem is, we watch them fumble around trying to login. Anyone who still uses the same password for every log in, or who writes down their passwords on a piece of paper and keeps it near the computer, or who stores passwords on a text file on their computer, are taking a vey big risk. But by far, the biggest risk takers are those using the same password for each login and those using simple weak passwords like sally58, password, hank518, etc. Because using the same password or using weak passwords leaves you vulnerable and open to having your password stolen. And it’s not a huge leap of logic to imagine that someone who has stolen your password will attempt that same password on financial sites — like your bank or PayPal. And you can imagine where that will go. We know that many of you still don’t have a password manager. Why? Maybe you don’t like Roboform. Maybe you don’t like LastPass. To each their own. So today we are featuring one of the new password managers that works pretty much like Roboform and LastPass, and which provides a very nicely functional free version — no bundles, no 3rd-party toolbars, nothing like that. It’s called Dashlane. We tested it during its beta (test) stage and we tested it again after it was released. And we were very impressed. It works just like Roboform and LastPass. You visit the site that requires you to login and Dashlane fills in your user name and password automatically and quickly. That’s it. Dashlane has a lot of great features – as many as the other two. So if you don’t like Roboform or LastPass for some reason, we highly recommend you give Dashlane a try. You’ve not nothing to lose and peace of mind to gain. The important thing to us is making it clear to you how important a password manager is to your security. Stop remembering passwords – From now on, all you’ll need to remember is your Master Password, which no one — not even Dashlane — has access to. Dashlane securely saves all your logins and passwords in one private place, under your complete control. All the personal data you store in your Dashlane account is encrypted locally on your own devices, using AES-256, which is used by military, financial, and government institutions. Since each user has his or her own encryption key, and the keys are not available to Dashlane, the encrypted data stored on our servers is of no value to hackers. And the keys are not stored anywhere by Dashlane. Dashlane’s Security Dashboard gives you a complete report on how secure you are online, and makes it really easy to upgrade your password security across all your accounts. Stop using the same password everywhere. Dashlane’s password generator creates unique, safe passwords for you — the best way to secure your identity and data online. So there you go. You need a password manager now more than ever. It’s just as important to your online safety as anti-virus and anti-spyware. Those of you without a password manager are taking a chance every time you spend time on the Web. There are no excuses for you not to have a password manager. Dashlane is free, it’s pretty easy to figure out, and they have a very nice online forum where you can ask questions and get answers. So don’t put it off another day. If you don’t have a password manager, try Dashlane. The free version offers plenty of features – the features you really need are all in the free version..
You can get more information and / or download Dashlane from the Dashlane web site. Finally decide to download this program & it won’t open for me..Unistalled & tried again..still won’t open…GRRRR! My name is Alexis Fogel, I am co-founder and Director of product at Dashlane. Sorry something went wrong. If you want you can contact us at support@dashlane.com so we can help you getting started. Please tell me why Dashlane insists I enter my credit card info. I have actually ignored that (exited set-up there) and the program appears to be operating but there may have been more information needed to fully use this? Dashlane is not only a password manager but it can also fill forms automatically for you so you don’t have to type your personal information anymore on the web. That is the reason we ask you to enter your credit card info (so it is saved in Dashlane and you can use it to fill forms automatically). Of course this is up to you to save your credit card in Dashlane or not, but at any rate be sure that there is no way we can access your data as it is encrypted on your computer and only you can decrypt it with your master password. I got Roboform long ago when you recommended it. It is great. I would love to hear your thoughts on Dashlane especially if you are a Roboform user. 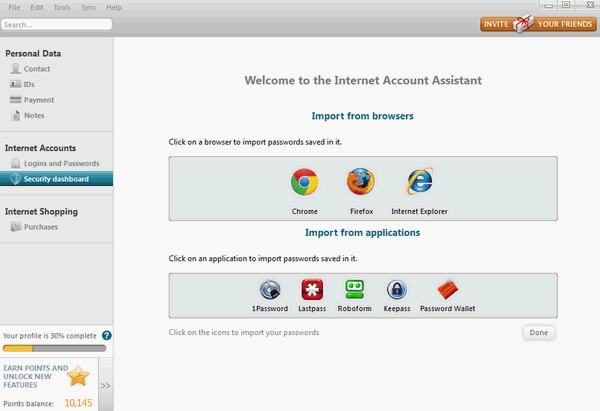 Keep in mind that if you want to give it a try you can import all the password you have saved in roboform directly inside Dashlane. Not worth a hoot, took over the computer and virtually locked it up. Never could get the control panel up to uninstall, finally got system restore up after several minutes of waiting and restored to before installing this worthless thing. I have an XP system. Stay away from this piece of junk. Sorry that happened to you, but this is the first time I hear this kind of experience from a Dashlane user. Are you sure Dashlane is the cause of your trouble? Dashlane was awarded PC mag editor choice (http://www.pcmag.com/article2/0,2817,2405130,00.asp) after a deep review of the app so I can assure you we don’t do anything like what you described. 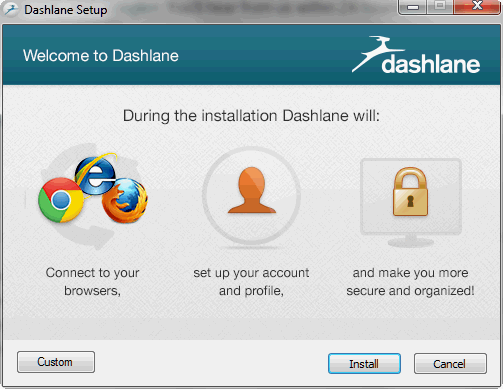 Plus, Dashlane can be easily uninstalled through the control panel. At any rate, if you give it another try and encounter any issue, you can contact us at support@dashlane.com so we can help you. Cloudeight is usually spot on with their free picks of the week, I have never had any problems with them. But I am sorry to say that Dashlane, I had a few problems with them. I am a former Roboform client, I have just got a new PC with Windows 8 on it, and have to learn how to use this. As I was downloading Dashlane, two files apparently did not download properly it gave me an error code 3. I thought it was downloaded, but no, I had to redownload it again. I was going to do it the hard way, and go into every site and have Dashlane save the password (like Roboform does), but apparently I am not able to do this with Dashlane. The reasoning behind this was that since it is a new computer, then Roboform would not be on it at all. At the moment however, I cannot even get onto my new computer, because my password to get onto the Microsoft account is not accepting, and I do not know why or how to fix this. Will be getting in touch with the Geek Squad to get me back in to working on the new computer hopefully sometime this week. I have never used a password manager before. I operate from as many seven different computers and maybe soon a tablet. Is there an easy way to use your program but keep the encrypted data file your program creates on a flash drive so it can be portable with me? Is there a version of your program that will work on Android and/or BlackBerry tablets? Wondering why this has not had a reply. I am using Past Pass. Will your program get my passwords from them or will I have to get new ones? Great free software. I personally use one of the oldest password managers – SplashData’s SplashID Safe and the feature that is most useful to me is the conveniently organizable and powerful record keeping system for sensitive business and personal needs. I’ve loaded it three times, and uninstalled it an equal number of times. Contacted “support@dashlane.com”, have yet to receive a reply. We test all the programs we recommend on three well-maintained computers. We cannot test it on hundreds of computers, only ones we have access to. The program ran elegantly for us and installed flawlessly. Keep in mind, we are not the developers of the software, we only tested it and recommended it. If you have problems with the software, you need to contact the developer who created it — they can assist you far better than we with problems with their program installing on your computer. If you’re using a security suite such as Norton, McAfee, TrendMicro, these programs have been known to interfere with all kinds of normal computer operations — including the installation of software. If you’re using one of these kinds of security suites, you should consider using one of the free security programs available. Other than interference from a bloated and pervasive security suite, we don’t know of any reason why the program wouldn’t install for you. Hence, your best bet is to contact the developers. I just installed this on my Nexus 10 running Jellybean 4.2.2, created an account and added my gmail credentials within the app. I then tapped on the “Go to website” button. It asked me to choose a browser so I chose Chrome for Android. It opened the browser and loaded gmail but didn’t populate the fields. I had to manually enter my gmail credentials! To check, I tried it again but chose Dolphin this time. Again, I had to enter my login and password manually. Never mind. I figured it out. 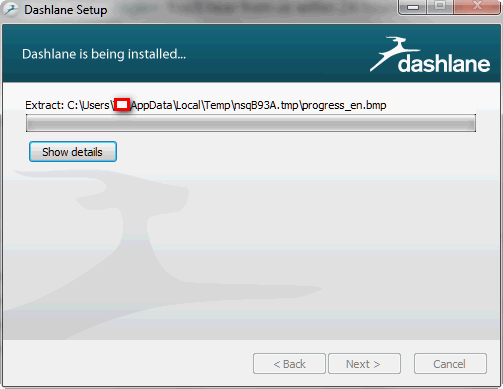 I have been using dashlane for some time now and here is what I think about it. The program works well with just about any browser I use, IE, firefox , opera. It works like a tool bar product. When you log into a site it knows the password to that site. This a great tool for that. To start with, I have tried briefly , lastpass and RoboForm, both seem like very good products, and both seem to work very well, but in the end dashlane offers more for less money at this point, its just a simple calculation. Easy of use, I like Dashlane over the others ( lasspass and RoboForm) I like options and Dashlane offers free options that others charge for (like phone options). In the end it just makes sense to get more for your money, dashlane just makes sense. The program works well with just about any browser I use, IE, firefox , opera. Not with Opera since it’s not officially supported by Dashlane. I strongly disagree. LastPass offers way more for less money. For example, you get six multifactor authentication options such as Google Authenticator (Free), Grid (Free), Sesame (Premium), YubiKey (Premium), Fingerprint Reader (Premium), and SmartCard Reader (Premium). Dashlane, on other hand, only offer support for Google Authenticator (Free). LastPass also offer more mobile support than Dashlane — Android, iPhone, BlackBerry, Windows Phone, Symbian S60, and HP webOS. I like options and Dashlane offers free options that others charge for (like phone options). It’s true that LastPass don’t offer mobile options in the free version. However, the free mobile options in Dashlane does not come with sync capability which is only available in the premium version so it’s kind of a moot point. Like I said, it makes more sense to go with LastPass since it offer more value for your money. They have a free version that works well for most users. We were not evaluating the paid version. Well, not for me. 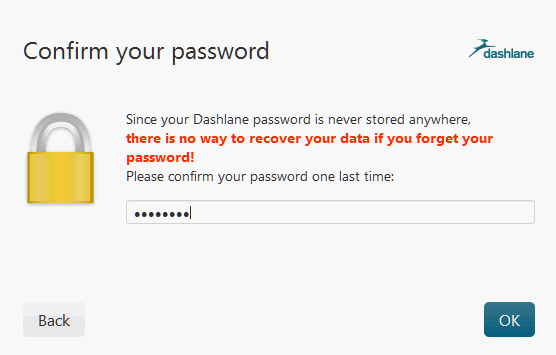 The free version does not back up your encrypted data to the cloud nor you can access your Dashlane account from anywhere through their website. You can only get those two features in the premium version. However, you can get the same features in LastPass for free. Not to mention LastPass beats Dashlane such as the ability to use one-time passwords or virtual keyboards for logging in via the web on a computer that doesn’t have LastPass installed. I’m not saying Dashlane is a bad product, but LastPass offer a better value for the features you get in the free version and the premium version as well (see my response to Ron). Please note that Dashlane (free version) was the only version available during the beta testing period and that’s the version we tested. Data was indeed encrypted when stored in its cloud. Also, Dashlane has indicated that it would not leave free users store unencrypted data in the cloud, and the free version does store user data in encrypted form. You cannot access data from multiple devices (smart phone, tablets, etc.) using the free version. If someone has only a desktop sitting in their home and that’s the only computer they have, then access from multiple devices is not necessary, and the free version would be fine for them. We don’t disagree that LastPass is the better of the two, but you miss the point. The point is — we don’t care which password manager a person uses, as long as they use one. It is absolutely foolish to use simple passwords or the same password for every site login. Users might have gotten away with it as little as five years ago, but they’re not going to keep getting away with it anymore. Sooner or later, those using weak passwords are going to have personal information stolen – it’s not a question of it, it’s a question of when. It is our main mission to keep people safe on the Web. Our preferences of password managers may differ, but no one can differ with the fact that anyone who doesn’t use a password manager to not only store strong passwords and make them easily accessible when needed, but also to generate strong passwords with upper and lower case letters plus numbers and symbols, is risking identity theft, and theft of personal and confidential data. It is imperative that everyone use some kind of password manager and start using it as soon as possible. Which password manager they use is secondary. We only featured Dashlane as yet another alternative to LastPass and Roboform. There are others too — like Password Box which we’ve also featured. We think Dashlane generates more controversy than necessary, maybe because it seem a lot more pervasive. In any case, we’re not here to argue which is the best, we’re here to argue that anyone who does not use a password manager is taking a huge risk. We’ve urged you to get a good password manager like LastPass (free) or Roboform. Roboform don’t deserve to be mentioned in the same sentence. I say this because I was once a loyal Roboform user until Siber Systems pulled a bait and switch on me (and other customers) by not honoring free lifetime upgrades. Their dirty stunt left a bitter taste in my mouth and because of that, I can’t in good conscience recommend Roboform and neither should you. That’s your personal opinion, it has nothing to do with the quality or usability of the Roboform program. We strongly urged Roboform to reconsider their decision to double-cross their lifetime subscribers, in fact we wrote articles about it several times. It was one of the most anti-customer things any company could have done. TC got fed up with Roboform when they double-crossed lifetime subscribers and removed Roboform has been using LastPass ever since. EB still uses Roboform — she successfully pleaded her case with Roboform and won a new lifetime license. To her credit, she also went to bat for everyone else too, but didn’t win that battle. You can have whatever personal opinion you want, but Roboform remains one of the easiest to use and best password managers. Those who didn’t have lifetime licenses at the time Roboform made their idiotic decision, don’t really care. Again — whether a users pays for Roboform, or uses LastPass (free) or some other password manager — we don’t care. We care that everyone use a password manager as not to do so puts them at grave risk — especially those who use the same password for everything or those using simple passwords. We don’t make Dashlane, you’d have to write the folks who do. I’ve started using Dashlane few weeks ago and i love it’s simplicity. One thing tho, sometimes it uses a lot of memory and my broswers slows down quite a bit, have you experienced similar issue? I kinda miss old times, when all my passwords were managed in my head, when the only tool i’ve used was online password generator, like http://www.keyspinner.com, which i still use for a quick password. One important issue you have not discussed is that for many, Dashlane seriously slows down the computer! This is not true, that’s why we didn’t address. We have seen no credible evidence from any credible source, including our own tests, that shows Dashlane slows down computers. We found once reference in a Google search to it but the sources was Get Satisfaction, which we don’t consider credible. Dashlane appeared as an exe that could be seen in task manager. I do not know how it got there, I did not download it or agree to anything and nobody else uses this PC. None of its functions showed up. I checked it out- downloaded it properly out of interest- It briefly functioned in some half assed way- but now I still have to do fill everything by hand and it has slowed my PC drastically. Why don’t you just uninstall it – you can do so from Control Panel/Programs or use an uninstaller like Geek Uninstaller.